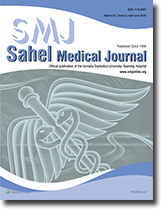 Sahel Medical Journal is a peer-review Quarterly publication of Usmanu Danfodiyo University Teaching Hospital, Sokoto, Nigeria, published since 1998. It seeks to promote global exchange of scholarly medical and scientific information. It publishes standard and high quality articles including original reports, reviews, letters to the editor, short communications, commentaries, invited guest editorials, conference proceedings, books and medical educational reviews. Table of Contents (TOC) email alerts: Receive an email alert containing the TOC when a new complete issue of the journal is made available online. To register for TOC alerts go to http://www.smjonline.org/signup.asp. Really Simple Syndication (RSS) helps you to get alerts on new publication right on your desktop without going to the journal’s website. You need a software (e.g. RSSReader, Feed Demon, FeedReader, My Yahoo!, NewsGator and NewzCrawler) to get advantage of this tool. RSS feeds can also be read through FireFox or Microsoft Outlook 2007. Once any of these small (and mostly free) software is installed, add http://www.smjonline.org/rssfeed.asp as one of the feeds.